Ferry ramps | Shipcon sp. z o.o. We design steel constructions of linkspans for harbour piers, giving facilities for ship-shore linking owing to the possibility of adjusting the height and gradient of a pier. Designing two types of movable ramps is offered. The first type is used for receiving a vessel platform and serves as a permanent pier on which vehicles from lower ship decks are unloaded. 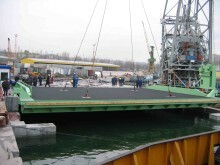 The other type of platform is used for unloading from upper decks. It is fixed at the end of an incursion wharf and is laid onto the ship deck. It constitutes a moving linkspan between a vessel and the shore.